Rota Fortunae (Wheel of Fortune): Much like the nimble silver ball spun by a roulette croupier, the cards in a tarot spread settle into their places after a figurative “spin” of the deck (the customary shuffle and deal). In the hands of a skilled reader, the outcome of this seemingly random array can be a revealing and often remarkably precise insight into whether a favorable or unfavorable future awaits the querent, at least as augured by that particular moment in time. Parsifal (Fal Parsi, meaning “pure fool”): In the Book of Thoth, Aleister Crowley likened the figure of Parsifal (from the King Arthur legend and Richard Wagner’s opera) to the “Holy Fool” of the tarot. Metaphorically, the Holy Grail of the Fool is the attainment of self-awareness and, ultimately, self-mastery by dint of a symbolic odyssey that slowly transforms him from a callow neophyte into a wise and seasoned adept. Parsifal’s Wheel: In what is commonly referred to as the “B.O.T.A.” version of the Rider-Waite-Smith tarot deck, the Fool’s coat bears ten yellow disks, several with eight red “spokes,” signifying- according to Paul Foster Case – “the ten types of vision, or higher perception, developed by occult practice.” (See The Tarot, A Key to the Wisdom of the Ages, Macoy Publishing Company, Richmond, VA, 1947.) Practical intelligence is also implied by the color yellow and the number 8. Bringing together these strands of symbolism, Key (or “Trump”) 10 of a typical RWS tarot deck is the similarly “8-spoked” Wheel of Fortune. 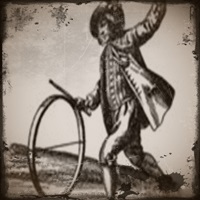 It sits in the eleventh position of the sequence, midway between Key 0 (the Fool) and Key 21 (the World), bringing to closure the first half of the Fool’s journey of self-discovery and stimulating a fresh start with a decisive “turn of the wheel.” This is where my personal path stood when I rejoined the tarot and astrology communities in 2011 after many years away, and starting this blog in the Summer of 2017 highlighted another phase of that evolution. I will be using this outlet to share my thoughts on the practice of tarot, Lenormand, traditional natal and horary astrology, geomancy and any other methods of divination I find interesting. You can expect commentary, opinion (including “attitude”), technical essays. history, self-made spreads (both tarot and Lenormand) and a few example readings. A random post or two about some of my other passions may occasionally make an appearance. I am also offering on-line tarot readings and horary astrology predictions, mainly of the “lost item” kind.